Who doesn't love boardgames? What about family time with your children or great-grandchildren? Have a family game night and combine the two! Hasbro's Family Game Night has tons of games to choose from and awesome ideas to have a weekly game night with your family! Create memories each week to last a lifetime. The old man and I love to play board games. The bad thing? We only have monopoly. Now nothing wrong with monopoly but when that's the only thing you play it gets a little boring. 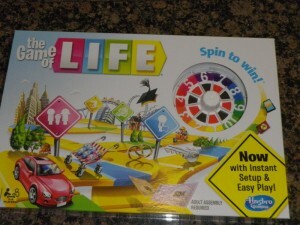 So if you are like us and need anew game to play then enter to win this awesome game. Mom Are We There Yet is hosting this awesome giveaway for The Game of Life. It is a new, improved version! Check out the review to see the differences. One lucky person has the chance to win their own The Game of Life. Disclosure:If a giveaway is being held: No purchase is necessary to enter. Void where prohibited by law. Odds of winning are based on number of entries received. Giveaways on this blog are in no way affiliated with Facebook or any other social media networks. Mom Are We There Yet and all participating blogs are not responsible for items not shipped by sponsor or items lost in the mail.